This article will also compare and the difference between Abstract Factory and Factory method pattern. I am using the same case study example so that difference can be identified between these two design patterns. While going through these 2 patterns (Factory Method Pattern and Abstract Factory Pattern), I always wondered they have a similarity in name; should there be some similarity in their code as well. However, I never got any single case study which could be used for both the patterns. Actually, they both work at different levels and can’t be compared. I always wanted to use a single case study for illustrating both the patterns in the interest of understanding where they can or can’t be used. Defines an interface for creating an object, but lets the subclasses decide which class to instantiate. Factory Method lets a class defer instantiation to subclasses. If you are a novice at abstract factory & factory method pattern. If you are confused between the abstract factory pattern and factory method pattern. If you have gone through many examples related to the abstract factory and factory method, but still unable to bridge the gap between these two. If you want to know what each class in the pattern does and how. If you want to spot the exact place where changes happen while switching from factory to abstract factory. The actual programming scenario case may not be the same for both the patterns, but for making these complicated design patterns, I am taking a simple real-life example of a pack of the meal offered by a food store Tesco Express. I am using the same case study example so that the difference can be identified between these two design patterns. This article will also highlight the differences between Abstract Factory and Factory method pattern. Sometimes, you have seen food stores like Tesco Express offering meal deal where you can select 1 type of the main course (Sandwich/salad/wraps), 1 type of snacks (Crisp/Chocolate/Fruit), and 1 type of drink (shake, smoothie, water). Delegating a responsibility of production to a specialist, with your specifications. Comparing design pattern terms with this real-world example, we get the following observations. Customer– Hi, do you have any offer for the meal? Customer Service – Yes, why don’t you try our meal deal option? Here you can have 1 main meal, 1 snack, and 1 drink. Customer –Sure, what are the option available with it? Customer Service – Sir, here are the options available under meal deal. Customer – Thank you very much! Whole code implementation for Abstract factory pattern. UI Class instantiates the creator to produce a product. 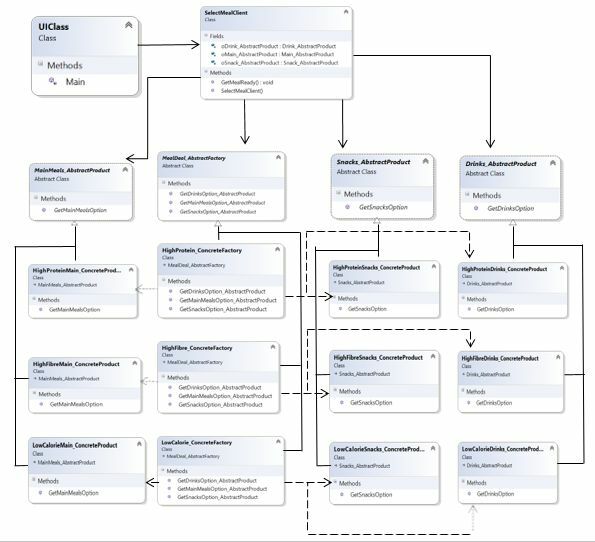 How objects are created - The object of the product is being created using inheritance of creator method which defines the abstract product, as it says instantiation to be deferred to the subclass which is creator class here. Where objects are created - Inside concrete creator. What it produces - A single product. The caller of the factory – Here caller of the factory is the main class, who knows which concrete factory will be used to create a product. Creator/Factory – It just defines a method to produce a product but it does not know which child product is being produced. There are many options available with the meal deal. It is a bit hard to choose among each of three types. So, how could it be improved? What if someone likes all his meal deal items with full of protein or fiber or low-calorie. The solution to classify these meals among specific categories like high protein or fiber can be implemented by using the abstract factory pattern. Provide an Interface/Abstract Class (of Product/Factory) for creating families of related or dependent objects without specifying their concrete classes (ConcreateProduct/ConcreteFactory). Comparing design pattern terms with a real-world example. Real life conversation along with abstract factory code will go like this. Customer– Hi, do you have any offer for a meal? Customer Service – Yes, why don’t you try our meal deal option? Here, you can have 1 main meal, 1 snack, and 1 drink. Customer Service – What types of food you would like to have in your meal? We have 3 types of diet, high protein, high fiber, low-calorie. Customer – Thanks! I would like to go have the high protein in my meal, what items I can choose for this? Customer service checks for the deal options for high-protein diet. Customer Service – You can have among sandwiches, crisps, and shakes. Customer – Nice, may I know what I need to select if I go with High-fibre and Low-calorie diet. Client code – Same as previous. Here, you can see that more options are added, no change in client code is required. Whole Implementation Code for factory method patterns is mentioned below. /// This decides how the final product will be prepared. /// but it does not know, what concrete product actually going to be produced. /// This is the place where, the functionality of implementating end product is defined. 1 abstract product is limited to 1 type of object implemented by a concrete product. Abstract factory is responsible to make complete product includes family or composition of abstract products. Concrete factory knows which concrete product to be returned. Where is it used - Abstract factory is used to produce a composed product (or family of related products) based on 2 or more filters (i.e. I want a meal deal (having main meal, snack & drink) with high protein) or you can say “applying another level of abstraction over a factory method”. How an object is created - Objects are created using composition. Where objects are created - Concrete factories implement factory method to create a product. What it produces - It produces a family of a related object. The caller of a factory – Caller of a factory, (which is called client here) does not know which concrete factory will be used to create a product. Factory – It holds a method to produce a composition of products or its family but it does not even know which concrete factory will be used to create a specific product.